Special Containment Procedures: SCP - TORT is to be contained within a sealed habitat designed to resemble wetlands. For observational purposes, a series of cameras with infra red filters are installed upon the corners of the habitat. Whenever it is necessary to conduct maintenance for any purpose, all lighting must be turned off within and immediately outside the habit. The maintenance crew will be provided with infrared visors so they can safely work in the dark. 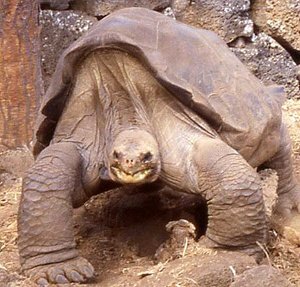 Description SCP - TORT is a reptilian organism physically resembling a Galápagos tortoise (Chelonoidis Nigra). It measures approximately 1.5 metres high and 3 metres from snout to tail. At last weighing, it was approximately 1500 kilograms, and its highest recorded walking speed is 0.25 km per hour. For the duration of any period of time wherein SCP - TORT observes any living subject, it will cease all voluntary motion until such time that SCP - TORT is no longer observing it. Those under the effect show signs of reflexive movement such as breathing, blinking or sweating. SCP- TORT will invariably use this ability to its advantage to approach, kill and consume any living being that it encounters. Foreword: Interview conducted one hour after retrieval of SCP - TORT. Dr Mark Innes was found at the scene. Closing Statement: Doctor Innes and all locals was given a Class C amnestic. Records and recollections of the case were altered to indicate the presence of a wolf pack. Special Containment Procedures: There must be two containment teams operating at all times. The first team must discretely observe and follow Gary Stevens at all times, save for the hours that he is within the confines of SCP - SE. The second team must observe his place of work and make a report on any person seen entering or leaving the premesis. In the event that more than one Gary Stevens leaves SCP - SE, both must be apprehended and the supervisor in charge of SCP - SE must be informed immediately. They will decide on the necessary action to be taken. All civilians must be dissuaded from entering the north facing door of SCP - SE. No Foundation personnel are permitted to enter the premesis without express level 3 permission. Description: SCP - SE is a warehouse located at [REDACTED]. Entrance is acquired through the north facing door, within which are a series of shops selling a variety of goods including food, furniture, cleaning supplies, books and games. No item purchased within SCP -SE exhibits signs of anomalous activity. Making use of any other entrance save the north facing door will merely lead into an ordinary warehouse, though any exit used while inside the affected area will lead to the expected location. All employees within SCP - SE (henceforth referred to as instances of SCP - SE - 1) are various versions of a thirty five year old caucasian male by the name of Gary Stevens, apparently hailing from a variety of parallel universes. Observation indicates that they each hold a variety of different positions within the warehouse, including (though not limited to) sales assistants, janitorial staff, managers, administrators and a marketing team. Special Containment Procedures: When not being used for experimental purposes, SCP TOPHAT is to be stored within a secure locker at Site 23. All personnel involved in handling, transportation or retrieval of SCP - TOPHAT are required to wear purpose built headgear designed to filter vocal communication. Experimental observers are required to view the experiment on a delay of twenty seconds or more to protect themselves from the effects of SCP - TOPHAT. Description: SCP - TOPHAT is a black silk top hat, size medium with the letters "TM" embroidered on the brim in white silk. SCP - TOPHAT's anamalous properties manifest whenever a subject possesses SCP-TOPHAT (defined as either holding or wearing SCP - TOPHAT), and asks a question. The exposed group will invariably alter their opinions regarding the question to match the opinion of the majority within the group. In the event that the question is asked verbally, the exposed group will consist of any humans that heard and correctly understood the question asked within a time period of ten seconds after it was asked. In the event that the question is asked through text or pictures, the exposed group will consist of any humans that saw and correctly understood the question while the text and the hat were in the possession of the same individual. Once either are removed, the opinions of all within the group will alter accordingly. Individuals with their opinion altered on any subject by SCP - TOPHAT will illustrate behaviour and psychological alterations in line with the question asked. Trivial questions have minimal psychological alteration beyond alteration on the subject while questions regarding political ethical or religious preferances often result in a significant behavioural shift. SCP - TOPHAT was discovered while being utilised by an extremist political group calling itself[REDACTED] based in [REDACTED], as a recruitment tool. The members would kidnap intended new recruits, and ask them questions designed to take advantage of SCP - TOPHAT's anomolous properties. A Foundation Agent working within the local police department was present for an interview with a fresh [REDACTED] recruit, and drew the Foundation's attention towards a possible mental altering item in the area. After observing the group for a week, recovery teams determined the likely cause was the top hat worn by the leader and the item was retrieved. All members were administered Class C amnestics. A children's picture that causes anyone attempting to communicate about it to lie. Increased exposure erodes ability to be honest about any subject. A teleporting item, possibly a cricket ball or an apple. Deliberately attempts to teleport within solid objects, causing mass in the area to disintegrate and displace to permit teleportation into specified area. Possibly keter. A magnifying glass. Anyone looking at something through the magnifying glass will believe the perceived item has a supernatural ability that remains constant for the item no matter who looks through it or whether there is communication between people on the matter. Those affected will have their senses manipulated into continuing belief item has supernatural ability where applicable, even when they should not be aware of activation of said ability. A liquid that permanently removes a person's ability to feel pain.